We are blessed here in Ireland for many reasons, one certainly is that for the lover of angling there are so many options that we are spoiled for choice and as far as the North West is concerned and in particular the South Donegal Bay area we have options available that even the discerning angler would have trouble in arguing about. While brief, the following information, hopefully will allow you, the angler, to understand the full options that are available to you. 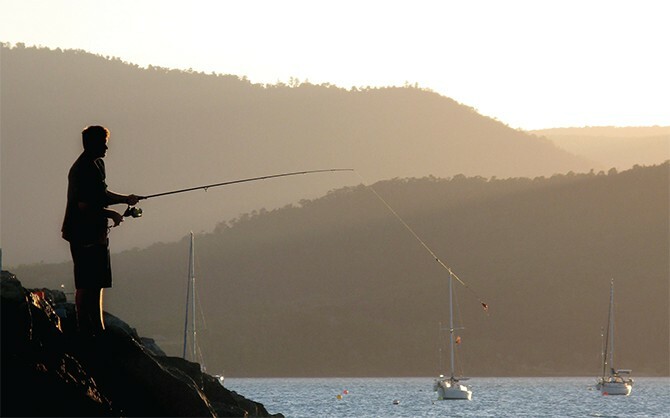 Whether it is Game, Coarse or Sea fishing. Download the Discover Bundoran for Angling brochure here. Check out this article written recently by a Dutch magazine. Donegal Bay has somewhere in the region of 30 different species of fish and It is not unusual for a day’s fishing to produce at least 5 or more species. A big attraction in recent years is the presence of Tuna in the Bay. A record 868lb Tuna was caught in Donegal Bay during September 2001. Most common species available are; Mackeral, Pollock, Pouting, Conger, Shark, Wrasse, Ling, Ray, Coalfish, Fluke, Flounder, Plaice. Everything considered a good days sea angling is almost guaranteed. Those who prefer shore fishing will find miles of excellent locations from Bundoran, right around to Rossnowlagh beach. Most popular shore fishing species are; Pollock, Cod, Wrasse, Conger, Fluke and Flounder. More information on sea angling can be obtained from the Donegal Bay Shore Angling Club section – click here for details. From Lough Melvin, which lies between Leitrim, Fermanagh and Donegal, you will find one of the finest lakes in the North West. This lake produces four different trout species, namely; Brown, Feroux, Gillaroo and Sonaghan trout, it also gets a very good run of Salmon and Grilse. From the Melvin the River Drowes rises and finally flows into Donegal Bay at Tullaghan. The Drowes traditionally produces the first caught Salmon in Ireland on New Year’s day each year. This is an excellent Salmon/Grilse river. The Duff River, which borders Sligo and Leitrim, on the N15, opens on May 1st each year and is also an excellent and very popular Salmon/Grilse river. From Salmon to Sea Trout on the Erne Estuary at Ballyshannon, if on a given day the fishing is not good you will certainly enjoy the scenery, which includes the highest banks in Europe. Sea Trout fishing starts on March 1st, and trout up to 5lbs have been caught on the Estuary, boats are available for hire at the Mall Quay. On Assoroe Lake, between the Hydro Electric Dams of Cathleen’s Falls and Cliff, you will find excellent Brown Trout and the odd Salmon. The Cashelard lakes are many, but to name just a few, Lough Unshin, Lough Colmkille, Lough Avogh, Rusheen Lough are all good trout lakes and have a large population of wild brownies. In the Pettigo region there are also very good trout lakes, Drumgun, Bannus and Lough Derg all produce good trout. The Murvagh at Ballintra is a very good Sea Trout river and often produces a Salmon or two. Durnish Lake at Rossnowlagh is also a very good Sea Trout fishery. The River Drowes is a renowned salmon fishery, famous for its success in producing the first salmon caught of the year. Although the fishing season starts on January 1st, March and April are recorded as the best month for catching Spring Salmon and from May onwards the Grisle (young salmon) and it fishes best early morning and before dusk. Recommended Flies: Lady Etna, Silver Rat. Recommended Bait: Flying C, worm and the prawn shrimp. Methods: all lawful angling methods, approx. 3 kilometres of the upper stretch are classified as fly fishing only on low water. Lough Melvin is unique in many ways, apart from being a completely wild fishery, it holds a stock of free rising trout. It is also unique in its variety of salmonoid species fish as well as a good stock of salmon and char. Regarding Salmon fishing there is a privately owned area of Lough Melvin where the Fly only rule is enforced, this is a private stretch of lake and is fished by permit only. The rest of the vast lake is public and free and locals generally troll for salmon. Melvin has a large stock of common brown trout and can be caught on the Fly or Spinner. Melvin is the historical home of the ‘red fellow’ (Gaelic Translation of the Gillaroo). The Gillaroo is an extremely colourful fish and feed in very shallow waters on fresh water shrimps and on emerging insects. Best conditions for catching the Gillaroo require a strong wind and a big wave. Kingsmill Moore in his book ‘A Man may Fish’ refers to Melvin’s Gillaroo as the partner of the water. Recommended Flies for Gillaroo: Golden Olive Bumbles, Gosling (Orange Bodies). The Sonaghan trout has been scientifically proven as being indigenous to Lough Melvin and are the main quarry for anglers on the lake. Though the legal limit is 9 inches the local angling club request a minimum of 11 inches on caught Sonaghan. When they are ‘up’ the fishing is fast and furious. They come up to feed on Dutch fly in April but it is generally mid-May onwards before the Sonaghan fishing peaks. Late evening approx. half an hour before dusk is a particularly good time to catch the local trout. The Sonaghan fishing can be good in September with the shoals concentrating in areas close to the spawning streams. Recommended Flies for Sonaghan: Hoppers, Bibio (Green tag), Dapplers. The Duff is a spate river and fishes well in high water. All legitimate methods of angling are allowed. The Duff fishes from the end of April through to end of season (end of September). There is good sea trout fishing on the estuary however angling on the erne is determined by the tides. Average size of sea trout caught on the estuary is .75 lb. Sea Trout can be caught from late March onwards. Spinning is a productive means of catching Sea Trout on the estuary, they will also take sand-ells and the fly. There are also Hill Loughs 6 miles to the North of Bundoran which hold a varying quantities of Trout. All legitimate methods of angling are allowed. Yes we have Coarse Fish here in Donegal and Fermanagh! While Assaroe Lake at Ballyshannon produces the greater proportion, namely; Pike, Bream, Perch, Roach, Eel and Roach/Bream hybrids, you will find that a variety of Course Fish exist on, at least,16 of the Cashelard lakes and at Belleek, in Fermanagh, there is good Course Fishing on the River Erne. All of the Pettigo Lakes have Course Fish. The Irish Pike Federation have run a few competitions on Assaroe Lake, all very successful. Compared to most regions throughout Ireland, this probably is the only undiscovered Coarse fishing paradise left in the country and it’s all waiting for you to come and catch that big one and be the first to have a recorded fish entered in the Specimen Records. You may be saying to yourself, is it possible that all this fishing is available within a ten mile radius, well we can say, categorically, that YES, we have, first class, Game, Sea and Coarse angling here in Donegal Bay.